Munich - Derby fever is set to grip the Bundesliga this weekend, with Hamburger SV's trip to SV Werder Bremen the pick of the Saturday afternoon fixtures on Matchday 2 (15:30 CEST). At such a nascent stage in the campaign, the Northern Derby carries extra weight, with both sides having been knocked out of the first round of the DFB Cup before both losing their league openers last weekend. Elsewhere, Schalke 04 face FC Augsburg, Bayer 04 Leverkusen are at home to SC Freiburg, and 1899 Hoffenheim go in search of their first win of 2012/13 with the visit of Eintracht Frankfurt. Hamburg welcome back old boy Rafael van der Vaart, as they chase their first points of the season at the Weser Stadion. The Dutchman hit 29 goals in 74 games during his first spell in the Bundesliga between 2005-2008, and could prove just the tonic to get Frank Arnesen's side up and running following the trials and tribulations of last term. An opening day loss at home to Nuremburg off the back of a first-round German Cup defeat at Karlsruher SC, though, suggests the green shoots of recovery are still some way off. Thomas Schaaf's Werder Bremen will be hoping to bounce back following back-to-back defeats to Preußen Münster and Borussia Dortmund. To their credit, the Green and Whites put on a much better show on Matchday 1 against champions Dortmund, with only a 90th-minute strike from Mario Götze denying the visitors a share of the spoils in a 2-1 reverse. Clemens Fritz spoke positively of his side's efforts, the Werder skipper's words implying there is no need to hit the panic button just yet. Schaaf's men have, however, won just twice this calendar year, with one of those victories coming in the most recent derby tie in Hamburg (3-1). Huub Stevens' Schalke also enjoyed a busy transfer deadline day, with the news that Dutch starlet Ibrahim Affelay is joining the club on a season-long loan from FC Barcelona. The former PSV Eindhoven forward found first-team opportunities at a premium in Catalonia, but will be hoping to put all of that behind him under the watchful eye of his former mentor, Stevens. If last week's 2-2 draw at Hannover 96 is anything to go by, goals certainly will not be a problem for the Royal Blues, with fellow Dutchman Klaas-Jan Huntelaar seemingly picking up where he left off last term, scoring his first of the new campaign. 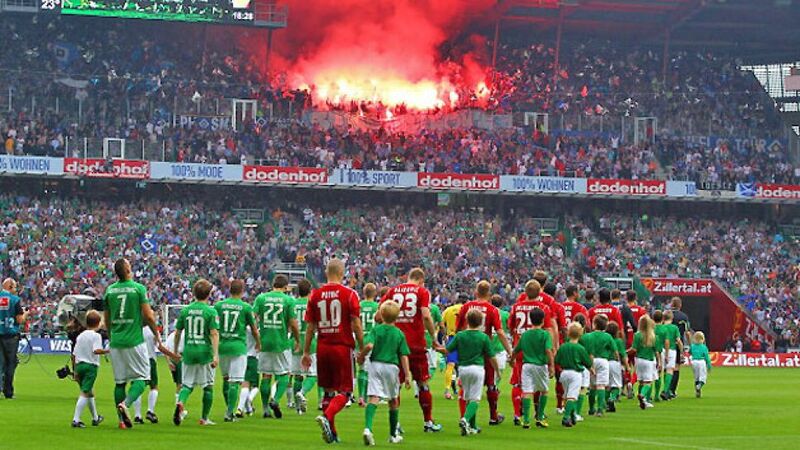 FC Augsburg travel to the Veltins Arena following an opening day home defeat to Fortuna Düsseldorf - the Bavarian club having failed to find the scoring touch that saw them ease past Wilhelmshaven in the German Cup a week earlier. New signings Aristide Bance and Knowlede Musona appear to have struck up a decent understanding going forward, though, and coach Markus Weinzierl will be hoping his prized duo can help the Augsburger avoid a repeat of last term's incredibly one-sided 3-1 loss on Schalke soil. The closing of the summer transfer window should provide much relief for those at Leverkusen, with star man Andre Schürrle set to stay put for now at least. The German international will be key to Die Werkself's Champions League-chasing efforts under Sami Hyypiä, but will need to help his side show much more of a cutting edge than they did against Bundesliga newcomers Eintracht Frankfurt on Matchday 1. Despite taking the lead through Stefan Kießling, Hyypia's men paid for their goalmouth profligacy with a 2-1 reverse. SC Freiburg recorded a 2-0 win in last season's clash at the BayArena thanks to goals from Julian Schuster and Daniel Caligiuri, in the process ending a winless run against Die Werkself dating back to 2004. New-recruit Max Kruse was on the scoresheet in the curtain-raising 1-1 draw at home to FSV Mainz 05 last weekend, and will likely be charged once again with leading the line on Saturday afternoon. To say 1899 Hoffenheim are having a rough time of it at present is a bit of an understatement. A 4-0 German Cup defeat to fourth-tier Berliner AK preceded last weekend's 2-1 loss at Borussia Mönchengladbach, with the early signs pointing to a long season ahead for Markus Babbel's charges. Hoffenheim took the spoils both at home and away the last time these two met during 2010/11, recording 1-0 and 4-0 wins respectively. Armin Veh's Eintracht Frankfurt have come a long way since then, though, it seems. Despite being bounced out of the German Cup at Erzgebirge Aue, the Eagles marked their return to the Bundesliga with a deserved 2-1 win at Champions League contenders Bayer Leverkusen on Matchday 1. Well-drilled defensively and a threat through Alexander Meier and Olivier Occean up top, Veh looks to have the makings of a team more than capable of consolidating their top-flight status.